"The immersive quality of the image is second to none." IMAX has unveiled a new four-minute behind-the-scenes featurette for Christopher Nolan's Dunkirk, taking us "Behind the Frame" and giving us a look at the incredible work on this movie. 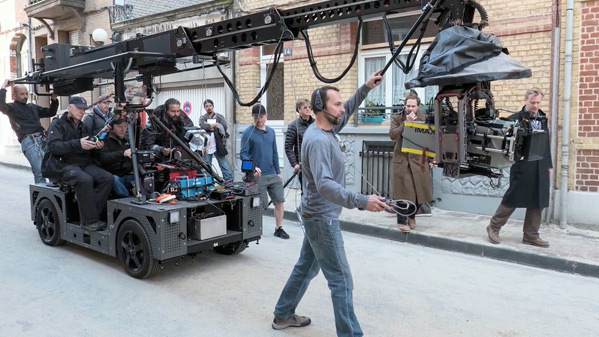 The video features extensive interviews with director Christopher Nolan, producer Emma Thomas, and cinematographer Hoyte Van Hoytema discussing how important it was to film 70% of this in the full IMAX format. "It is the most beautiful way to watch a movie." This stars Mark Rylance, Tom Hardy, Cillian Murphy, Kenneth Branagh, James D'Arcy, Harry Styles, Aneurin Barnard, Jack Lowden, and Adam Long. This is an excellent featurette that has boat loads of behind-the-scenes footage and lots of good discussion about making this intense WWII film. Hitting theaters soon. You can still see the first teaser trailer for Nolan's Dunkirk here, or the second trailer or third trailer here.